Do you feel worn out? Wondering how to get everything done in your day? 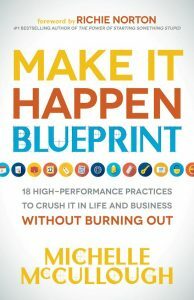 Then keep on reading to learn more about Make It Happen Blueprint by Michelle McCullough. Note ~ An Amazon affiliate link to the book is present in this post. Using the link to purchase costs you nothing and may result in this site earning a small commission. Despite living in a world of abundance, many people still feel unhappy, over-scheduled, tired, and unsuccessful. Yet there seems to be a group of people who “get it.” They catch all the breaks, accomplish more in a day, make more money in their business ventures, bounce back from trials faster, and always have their lives in order. Are they just lucky, or is there some sort of secret most of us are missing? Michelle McCullough has spent thousands of hours studying, listening to, and learning from success experts including Stephen Covey, Jack Canfield, Brendon Burchard, Jim Rohn, Brian Tracy, Ken Blanchard, Darren Hardy, and more. Applying key principles (and learning a few things on her own) she’s built three successful businesses and while still maintaining a meaningful personal life. Everyone has the ability to be a high performer. All it takes is the right mindset, the right tools, and a willingness to work. As she shares eighteen practices for high performance, you too can learn how to take your business and personal life to the next level. Success is possible, happiness is achievable, so stop dreaming about it and get out and MAKE IT HAPPEN! -Success is not a destination, it’s a practice. The actions we take every day, week, and month to make our dreams a reality are what determine our success and happiness. – “Plan” is the four- letter word for success. Peak performers know this, and they find power in a plan and thrive on the execution and ultimate success of seeing it through to completion. -Trying to do two things at once is a recipe for failure. The time has come for you to give up your “Multitasker of the Year” award. -High performers don’t just understand the value of a person—they understand the value of every person. – If you’re going for a gold medal in raising high performers (and I hope you are), daily ask kids this powerful question, “What did you do to make someone else happy today?” This helps them become more aware of others. Michelle McCullough started her first business when she was 19 and currently runs 3 companies including consulting other businesses all over the world. A seasoned speaker, Michelle teaches success principles and leadership insights that help boost employee engagement and higher performance. In addition to running her own consulting businesses, Michelle is the managing director for Startup Princess, listed by Forbes as “One of the top 10 resources for Women Entrepreneurs”. She’s worked with top brands like Visa Small Business, UPS Store, AWeber and more. She’s spoken for the Air Force Reserve, Goldman Sachs and Ancestry.com, among others. She’s been featured in entrepreneur.com, in the 40 under 40, Fox TV and has been interviewed for television and radio over 100 times, including Good Morning America and The Today Show. She was recently named in the Top 100 Small Business Influencers with Inc Magazine, Michael Gerber and Grant Cardone. Her own radio show “Make It Happen” has over 1 million downloads.